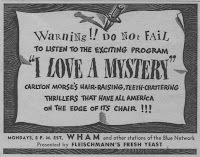 During the late 1930s early '40s there was a very popular radio program called "I Love A Mystery". I think many of us do, judging from the popularity of the whodunit genre of books and movies. Even the Antiques Roadshow is really a mystery program. And just like other mystery programs the audience participates by helping the detectives. They offer valuable assistance by screaming at the tube. Things like, but not limited to: "IT'S ART MODERNE YOU IDIOT, not art déco. Any fool can tell you that!" and, "twelve hundred dollars? Who going to give you $1200 for that? I had one out for sale for fifty dollars and not only did no one want it, there was a whole bunch that looked pretty hostile at my even asking fifty. They were ready to grab the torches and the pitchforks and look for a hangin' tree." Today we picked up this thing at a yard sale. It's just a little mystery not a big one. But here we go. We think it's a kind of mezzaluna, a food or vegetable chopper. But perhaps it's not that easy. So let's have a look. The handle is really three bits: the center is lathe turned which suggests factory-made to me. The end bits are carved walnut, with clear tools marks which suggest hand work. The iron blade is set into the handle with two pins or rivets or nails, can't really tell. And there are no maker's marks or patent stamps or any other indications of commercial manufacture. Anyway is it factory or home made? Probably factory, but we really don't know. And don't forget that there are other tools which can have a similar look as well such as a leather worker's half moon tool. I've seen a plumber's half moon too, but that's another story that we'll save for adult swim time. So there you have it. That's the mystery and the process and until we find hard evidence of what it really is, it's all conjecture. Even if great gran' swears to you that she used one exactly like it in nineteen ought two, (you remember... that's the year the storm took away poor old Mr. Jenkins and his one good milking cow, that he called Annabelle, but who's real name was Mary Margaret), it's still anecdotal. I didn't say it was a good mystery. And I didn't promise a satisfying answer, but I will let you know if I ever find out for sure.